We had a chance to interview Bianca Stone, poet and illustrator, for this week's interview! Check out her website for some poetry comics First please tell us a little bit about yourself: Are you pursuing and MFA? Where do you go to school? I finished my MFA in poetry at NYU in 2009. Since then I’ve been living in Brooklyn with my boyfriend, Ben Pease, who is also a poet and went to Columbia for his MFA. I work for Sharon Olds, (who was my professor) as an assistant/helper. I also do small teaching things here and there. I'll start with the age-old question: What came first the poetry or the comic? Poetry has always been extremely important to me. My mother Abigail Stone, is a writer. My grandmother, Ruth Stone, who passed away last November, was a working poet my whole life and I spent a lot of time with her. 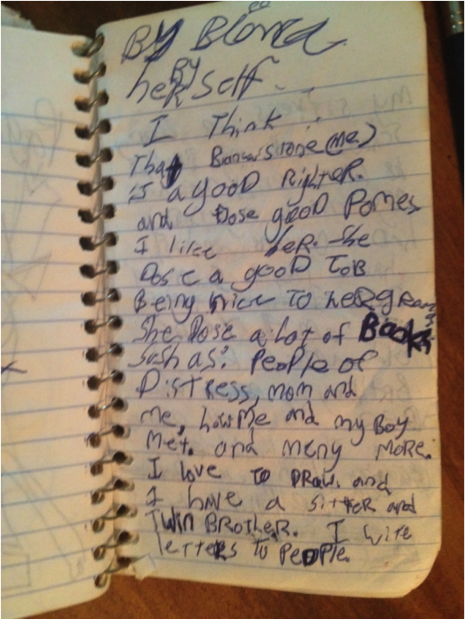 I’ve always known I would be a writer. That said, I’ve also always been a visual artist. In undergrad I imagined that I’d study stuff other than writing...I pretentiously thought I didn’t need to. But the art department at Antioch College wasn’t the best, and when I started taking writing workshops I realized it was really right for me. My writing professor there was Benjamin Grossberg, and he was really important to me. There was so much I learned about being a reader and a writer. I read a lot. The same really goes for my MFA, I learned so much, I don’t think you ever stop learning new things with poetry. It’s really imperative that we keep challenging what we think we know, and trying new things, reading everything. It wasn’t until I was in my MFA that I started putting my poetry and art together. Making poetry comics was an exciting revelation for me. When did you begin writing? Do you remember the first poem you wrote? What are some of the main themes you are interested in pursuing with your work? That’s a good question, but one that is often changing. I was just looking over my full-length manuscript of poetry and thinking that the main theme of the book seemed to be a lot to do with the difficulties and the pleasures of love. I’m interested in the human condition, how we interact. I like to look at the seemingly ordinary and make it strange. I’m also very interested in science and neurology. I love writing about the mind, the brain, which I think is actually an age-old subject of writing. But what’s exciting in art is that we continue to look at these traditional themes through what we interact with now. Science is so important, and evolving, there’s always so much there to explore through art. What is the best typewriter you have ever used? My beloved Royal Quiet Deluxe that my mom gave me. Sadly it was broken in my recent apartment move. But I have others. Are there any issues that you won't touch in regards to your poetry? Of course. But I’ve never liked people creating poetic “taboos.” Every writer has things they would rather not have in their poems, that’s what makes each writer unique. However, we also have to always keep ourselves in check, and challenging our own poetic taboos. I think our personal taboos are ironically very close to what we want to write about. It’s scary to even give them voice. Sometimes I think, Oh, I could never write a “political poem” but then I think, I have written political poems! It’s just that it’s through my own methods, and not other people’s. What was your first chapbook titled? How did you come up with the name for it? It was my “biggest” poem, both in length, and in spirit. I wrote it after doing a few wedding photography gigs with my sister, who is a great photographer (and poet). I had just begun dating Ben, and I was thinking a lot about what it means to be in a serious relationship. I was at all these weddings thinking: This is some of the only times that people hear poetry, or write it. And then I was thinking, God, it’s all just the same crap, mixed around. People are supposed to write these “Vows” and they mean so much to them, but honestly, they mean nothing to other people. Someone else’s vows are meaningless, and yet, they’re all so analogous. It both revolted and excited me. What was publishing your first chapbook like? GREAT. I was all worried at first, since I didn’t know Liz Clark Wessel, and this was their first chapbook. But she was so wonderfully excited about my poems, that I realized that it made a lot of sense to have them do it. We became great friends, and Argos Books is so serious about what they do, and they’re marvelous, fun, professional, and feel so passionately about their writers. Having a chapbook is great because maybe your book isn’t ready, but your work can get seen, and you have something to sell at readings. It opens a lot of doors, and feels so good to have and hold. How did it feel to touch it for the first time. It was letter pressed and hand-sewn: It felt good, literally. I don’t think that initial excitement can ever be recreated. I was so proud. And she just did my second one I Saw The Devil With His Needlework. It’s so special to have a press that would do two chapbooks. How long did it take you to find a publisher for your chapbook? At my desk. But I’ll write anywhere. Sometimes on the subway. Mostly I write on my computer at my desk, in the morning and afternoon. Are you like J.K Rowling? Could you write on napkins in the middle of a busy bar, or do you have to be somewhere specific? I’ve never had a problem writing anywhere. I would write and draw all over the paper table cloth at Café Loup when I was at NYU. I find envelopes with poems on the backs of them, even receipts with poems on them. I get grumpy if I’m writing and Ben bothers me, or the phone rings, but I can do it anywhere, as long as people leave me be. For me it means writing poetry and never feeling like you have to apologize for it, or say that it’s not a living. It always makes me mad when people act like it’s not a living. It’s irrelevant that it “doesn’t make money.” You do it because it’s important. And because you’re good at it. You do it because it needs to be out there. You always find a way to support yourself. It’s important to establish a community with poets and artists, too. To help each other out; share and encourage, and cultivate one another. Can you give us some of your favorite poets? Where do you hope is next for you and your poetry career? Publishing a full-length book of poetry at a good press. I have been waiting my whole life it seems, and I’m finally feeling like it’s ready. You have to be patient with something that you’re very impatient with. It’s a nightmare. And a blessing. The other hope,of course, is to publish a full-length color book of poetry comics. Devon Miller-Duggan is the author of Pinning the Bird to the Wall (2008, Tres Chicas Books) and the founder of Kenning Journal. 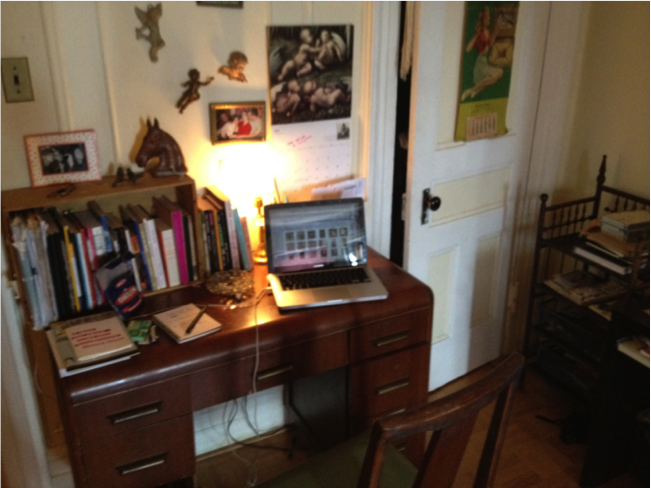 Devon is a professor of English at the University of Delaware and she has decided to share her writing desk with us. 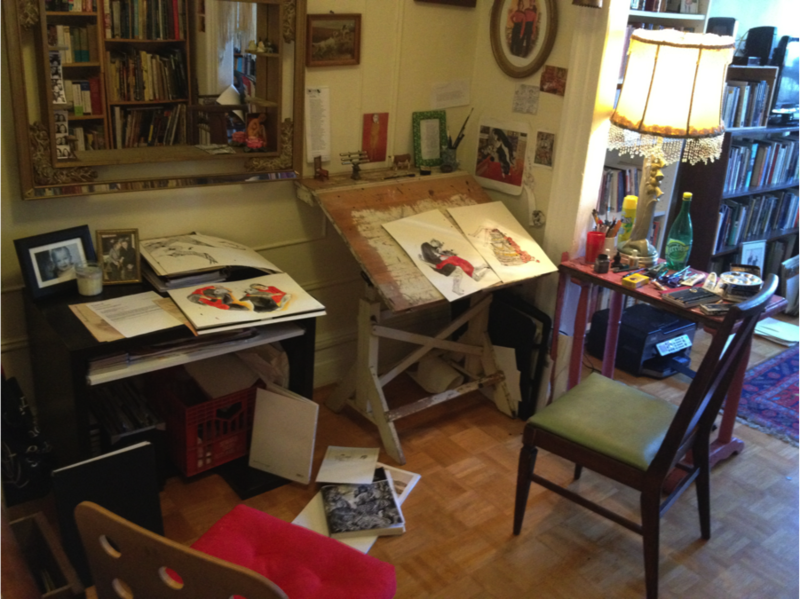 According to Devon: The photos made me very conscious of how much STUFF I have in my office--the piles and piles of papers. 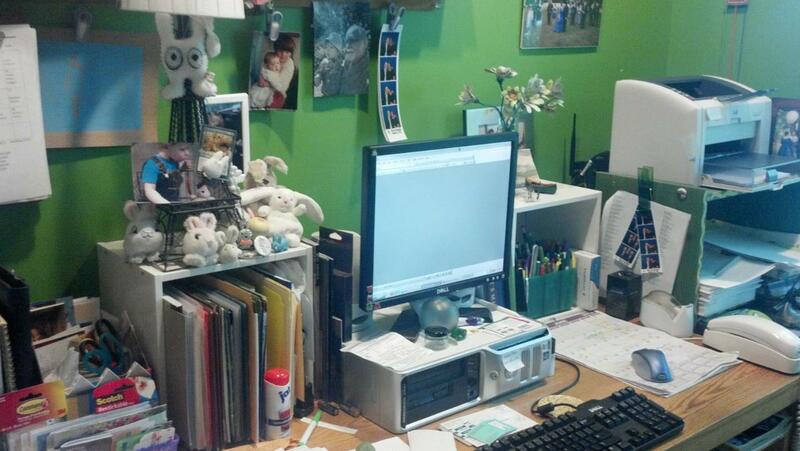 And this is my desk in its cleaned up form--which happens once a month or so. Otherwise, I'd get lost there. There's a collection of bunnies. I'm (not entirely comfortably--it definitely cuts down on my "cool") very fond of rabbits-as-images, but also kind of embarrassingly fond of small, round, furry things--tribbles of one sort or another. 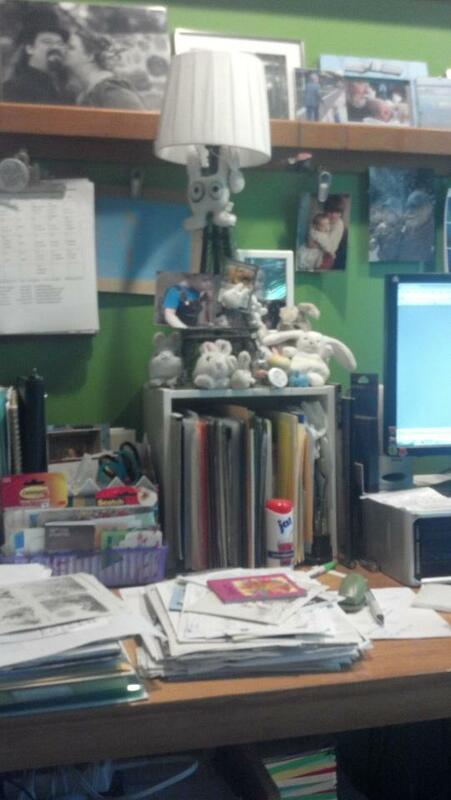 I think I'd be just as well off with an essentially empty desk, because I forget all the time what's in most of the folders and nothing bad happens, but that doesn't seem to be in my nature. I'm a clutterer. I do have this huge window that looks out onto my forest-y back yard, so there's more or a sense of space in my study than my desk would suggest.